But afterwards, believe me, you will be glad you invested all this time and effort and self-restriction. I had some the day I made them, and some more the next day, re-warmed for Sunday breakfast. And I put almost the entire loaf in the fridge and will be making Bostock of it on Easter weekend. Brioche has always been my favourite escape from my Lenten promise, because it is not really a sweet but definitely a treat. 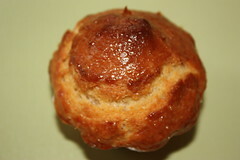 But self-made brioche is even better. I made it without any sugar, and missed nothing. The Parmesan Sablés turned out pretty good. I love baking savory treats! They turned out a lot like the first Sablés I made in autumn, despite this time they didn't spread (what I suppose they shouldn't, so don't ask me what went wrong in December). And I became a little better at shaping them into logs and get them round. Somehow, I still do have too much wholes in the dough. So I have to re-shape them heavily and cut them very carefully, so they don't break due to the holes in the middle of the circles. Don't know what is wrong. The first and the second rack I made where lovely, just the second got almost burned. The problem might have been that I didn't wait long enough to let the baking-rack and the paper cool down completely. So already after about 8 mins baking time they were dark, dark brown.